The app will ask you to create an account, you'll use this account to sign into the website as well. Make sure to configure the app to your likings, and set the update frequency. You can also select more than one device and track them all on the same map! Help! The app stops transmitting! Starting from Android 6.0 Marshmallow, Android will by default battery optimize most apps. This means it will limit what GPeaSe is allowed to do in the background, and it won't be able to transmit in some cases. If your phone is doing this, "Ignoring battery optimizations" will be in red. To fix, simply tap on "Ignoring battery optimizations" and follow the instructions to create an exception for GPeaSe on your phone. If you've done this correctly, when you return to GPeaSe you'll see "Ignoring battery optimizations" will be in green! Go to the settings screen and make sure the app is set to transmit at a fixed time interval of say every 10 seconds. 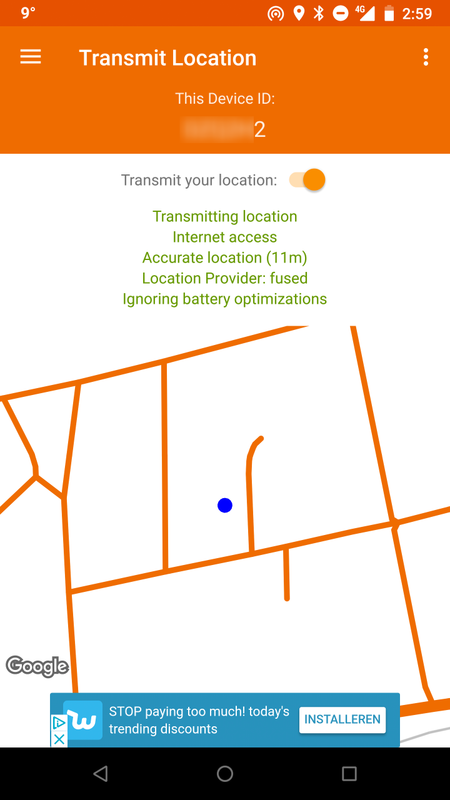 For testing purposes you should uncheck "Only use GPS for locations", because this will prevent GPeaSe from transmitting when you are inside buildings or in places with bad GPS reception. Step 1: Try to use remote ping instead. On this website, click on the icon for your device. Scroll down to the Remote Control section and click the green "Start Remote Ping" button once. Every 30 seconds we will send an invisible message to your device to ask it for its location. You do NOT need to switch on tracking from within the app, but the device needs to have transmitted at least one location before you can use this feature. When you are finished, make sure to switch it off from the website using the red "Stop Remote Ping" button, as you can't switch it off using the app.